Hundreds of thousands of hip and knee replacements are performed in this country every year. The numbers are only set to increase thanks to the preponderance of aging baby boomers. If you had a choice between a hip or knee replacement surgery that could potentially lay you up for weeks and one that could have you walking out of the hospital unassisted within 24 hours, which would you choose? That’s precisely the question orthopedic surgeon Dr. Douglas Roger finds himself asking patients these days who are in need of such procedures. As the medical director of the Joint Replacement Program at Desert Regional’s Institute of Clinical Orthopedics and Neurosciences, Dr. Roger’s area of expertise is in enhanced recovery hip and knee replacement. When Dr. Roger first began his orthopedic training more than 20 years ago at Albany Medical Center in New York, patients who’d undergone hip and knee replacement surgery faced a challenging recovery. They commonly remained in the hospital for a week to 10 days and then faced lengthy rehabilitation. Observing all this firsthand led Dr. Roger to want to lessen the impact these procedures had on the human body. The quest remained on his mind while he established his Palm Springs medical practice in the mid-’90s. At the same time, technology for hip and knee replacement was evolving, as were surgical techniques. In 2004, Dr. Roger began performing a less invasive knee surgery technique he developed right here in the desert. Known as the Subvastus Knee Approach, its success relies on the ability to get in and out of the knee without cutting even a single muscle fiber. 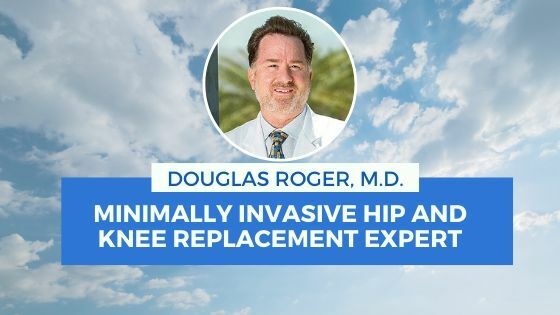 At this juncture, Dr. Roger has completed more than 2,000 of these knee replacements which allow patients to have more immediate function, a great deal less pain post surgery, and a much faster recovery. About five years ago, he began performing a similar surgery on hips and it too has met with great success. The Direct Superior Approach allows a surgeon excellent visualization. It involves one small incision and the ability to get in and out of the hip joint, disturbing as few of the important structures as possible. DSA was evaluated by orthopedic surgeons from the Mayo Clinic and was found to have much less muscle damage compared to other surgical approaches. To date, Dr. Roger has completed about 600 hip replacement surgeries using this technique and generally people walk out of the hospital by themselves the next day. Trevor Temple is one of them. The 64-year-old Canadian businessman was on a waiting list to get a new hip in Toronto but began to wonder if he could really spare the eight or so weeks he’d need to recover. Traditional hip replacement surgery was the only kind his Toronto doctor was offering. Then he attended a lecture given by Dr. Roger describing his less invasive method promising a shorter hospital stay, less pain, and a better early outcome. Temple was so impressed that he was willing to pay out of pocket for the elective procedure. “I literally walked out of the hospital 24 hours later without any apparatus. No cane, no crutches, no walker. They had me up and walking about 2 1/2 hours after the 45-minute surgery. I experienced almost zero blood loss. I had a little difficulty putting on my sock and tying the one shoe but that only lasted about five-days and was likely due to my incision,” he says. Needless to say, he’s already recommending the procedure to friends. Once DSA was established, Dr. Roger published his results in the January 2012 issue of scientific orthopedic journal Clinical Orthopedics and Related Research. Recently he was invited to give a video presentation of his work at the annual 2015 meeting of the American Academy of Orthopedic Surgeons. This event brings together approximately 20,000 orthopedic surgeons from all over the world. Dr. Roger is also part of a think tank for like-minded professionals. He’s written a surgical technique with Dr. Anthony Hedley, a pre-eminent hip surgeon who currently practices in Phoenix. And he’s in the process of writing a teaching curriculum with Dr. Mike Ries from UC San Francisco. News about the advantages of DSA is spreading among medical practices. Orthopedic surgeons from other areas frequently visit Dr. Roger to learn his hip and knee replacement techniques. His method is now routinely used by a group of doctors in Phoenix. A surgeon in the San Francisco area has adopted it, as have some doctors in Louisiana and still others at Washington University in St. Louis. A world renowned orthopedic surgeon recently traveled all the way from Australia to see Dr. Roger’s innovative hip replacement technique. “The purpose of hip and knee replacement is to enable people to keep active so they can maintain a healthy lifestyle,” Dr. Roger says. He adds that many authorities believe hip replacement surgery to be the single most successful operation in history. If a hip or knee replacement looks to be in your future and you remain unconvinced by the minimally invasive hip replacement and knee replacement procedures, consider Desert Regional Medical Center’s ranking among Health Grades Top 100 Hospitals for Joint Replacement in the country. It’s also the only hospital in the Palm Springs area to receive the Gold Seal of Approval by the Joint Commission for hip and knee replacement surgeries. These achievements are mostly due to Dr. Roger’s fine work there. A 1989 graduate of Georgetown University Medical School, Douglas Roger, M.D., has practiced in the Palm Springs area since 1994. More about less invasive minimally invasive hip and knee replacements.